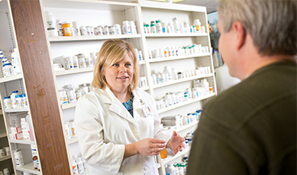 PharmaCare is a full-service retail pharmacy, featuring over-the-counter items, vitamins and natural supplements, orthopedic supports and breastfeeding supplies. DeKalb Health PharmaCare also offers prescription compounding and customized medications for those seeking to avoid sugar, preservatives, dye or lactose. For those that don’t like the taste of their medicine, the pharmacists can flavor pediatric and other liquid medications, even compounding veterinary medications to meet your pet’s needs. PharmaCare accepts e-prescriptions from area providers; for those in other communities in DeKalb County, PharmaCare offers, even more, convenience in the form of free prescription delivery to the Auburn, Butler, Garrett, and Waterloo areas.